The cliche statement about solar power is - " Its Expensive!" , but this is the way the normal thought process is. However, thinking from a larger perspective, Solar Power is in fact the most efficient form of power and also the most cost effective. Let me first talk about the efficiency and later about the cost. As per the sankey diagram below, It is quiet clear that for every 100 units of input energy from coal, only about 21% reaches the end user, considering the generation and distribution losses. Just keep in mind the 21% figure. 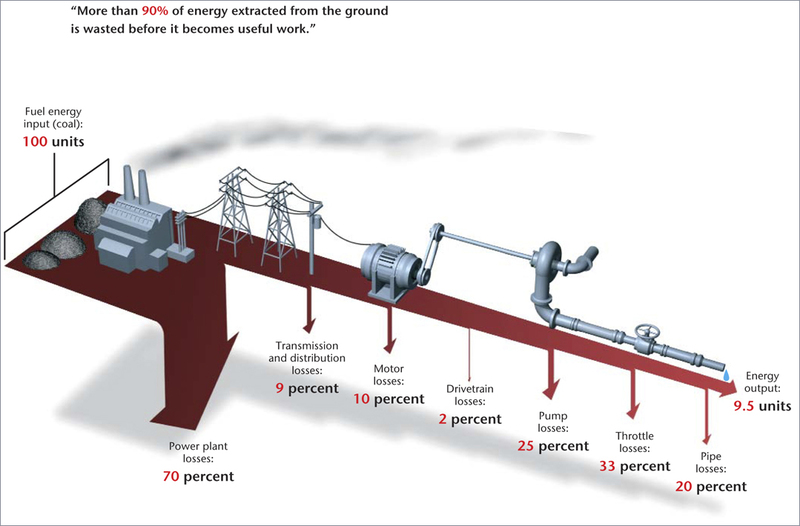 The figure of 9% transmission losses is a very positive figure for a country like India, however, I have used it for the purpose of analysis. This is as the world sees things normally. Going back to the basic lessons on science which were taught to us in the primary school, we can recollect that Sun is the mother of all the various forms of energy that exist around us. All sources of energy below the surface of earth like coal, uranium, petroleum, natural gas or on the surface like hydel, tidal etc or above the ground like wind energy can be traced back to the energy received from the sun. In fact, in case of coal or petroleum, there is a delay of 300 million years between the time the energy arrived on the earth and the time we use it to fuel our power plants. When we talk about efficiency, we must consider the efficiency of this process too! The conversion efficiency to coal (over a period of 300 million years) cannot be more than 50-60%. Considering both efficiencies of 21% and 60%, we see that from Solar Energy to Electricity conversion (including 9% transmission losses) in case of a coal fired power station is 12-13% at the very best! Comparing this with the present photovoltaic technology where sunlight to electricity conversion happens at the minimum of 13.5% (15% at generation and 9% transmission losses). Who do you think is more efficient? I have not even touched the energy that is lost in the mining activity, transport and other activities in the whole supply chain. Let us for the time being assume that the same amount of per unit energy consumption goes into the supply chain of silicon and solar cell fabrication. As per the cost of energy, it true that for the end consumer, electricity is available at a very low cost. However, in order to facilitate that there is a huge amount of subsidy that is spent by the government. As per Energitica, a well known publication on energy matters, Coal India Limited, a govt. owned public company is the largest supplier of coal in India and sells coal at roughly 50% of the global prices on energy equivalent basis. Last year, Coal India sold 431 million tonnes. On a conservative estimate of Rs 1000 per ton price differential from international coal prices, the implicit subsidy translates to Rs 43100 crores per year. Over and above the subsidy, the average T&D losses of 33% further makes the price per usable unit of electricity dearer. This consciousness about the energy price is very clear to the GOI and hence, they have introduced excellent mechanisms to make the use of Solar PV electricity extremely viable. In fact on a life cycle cost basis Solar PV power can be much lower than the grid power purchase. In the next blog I will throw further light on "How to make Solar PV power viable". Till then I hope you are partly convinced that Solar Photovoltaics is competitive in efficiency as well as generation cost with the so called conventional and cheaper coal generated power.